As an owner of Palm Beach County Landscape, my wife Kathy and I moved to Florida after 32 successful years of working for a major agriculture company in Kansas. After attending college at Kansas State University, my professional background and area of expertise has been centered around managing weed control issues in large-scale agronomic situations combined with drought and water management techniques that can be directly applied to the landscape industry. Having been raised in a small rural community and working on a farm since the age of 12, it seemed only logical that I spend my post-graduate years working directly with farmers and industry partners in the Midwest. With this agricultural background you quickly learn that the building blocks to success are built upon the foundation of dedication, a strong work ethic combined with a set of morals and values centered around a strong customer service platform that is almost unheard of in the landscape industry. My belief is that if you “do what you say you will do”, are honest and transparent in your dealings with people and provide customers with the best landscape services possible, then you will have the opportunity to earn their business and create a long-term partnership where everyone wins. Our company motto is “Exceeding Expectations In Everything We Do” and we strive to deliver on that promise each and every day. My role within the company is to provide the leadership and the resources necessary to deliver industry-leading landscape services combined with an unparalleled level of customer service and attention to detail that is unique to the landscape industry. We strive to become a partner with you while helping to address and fulfill all your landscape needs in a professional and dedicated fashion. 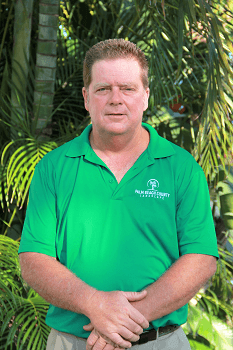 As an owner of Palm Beach County Landscape, my husband Mark and I are excited about our opportunity to take our extensive customer service experience we learned while growing up, living and working in the Midwest and applying those skills and values to the landscape industry here in Florida. Having been raised on a farm in the Midwest and then working with farmers the majority of my adult life, my love and passion for plants and landscape design began at an early age. As a working mother, my career was centered around my office management skills and providing unparalleled customer service while simultaneously raising 2 very successful daughters. My role with Palm Beach County Landscape is to help manage our diverse labor force that provides all of our landscape services as well as managing all the human resource and accounting functions required to run a successful business. With my love and passion for landscape designs, I am also actively involved in the daily operation of our business including manpower allocation, landscape design, installation scheduling and maintenance programs as we strive to provide exceptional, creative and unique landscape solutions to all our customers. With over 20 years of horticultural experience, my landscape experience began as a child working for my father who owned his own landscape company. Over the years my professional career has grown and evolved into virtually all aspects of the landscape industry including managing entire landscape companies. As I became proficient in different areas of the industry, my constant desire to exceed and excel culminated in achieving several high-demand industry certifications such as a Certified Pest Control Operator, a Landscape Horticultural Instructor, an Aquatic Biologist as well as being a CPR and Safety Instructor. In addition to these industry certifications, I also spent several years in the fertilizer industry with a focus and an extensive background in designing custom fertilizer blends for southern Florida landscapes as well as understanding and teaching proper application techniques and certifications to on-site landscape crews. As a Senior Account Manager for Palm Beach County Landscape, my passion today lies in working with Property Managers on a regular basis to anticipate their landscape needs while simultaneously managing our landscape crews to deliver unparalleled levels of customer service and impeccable commercial landscape maintenance programs designed specifically to each of their individual properties.